About Grosvenor Vale The St.Georges Stadium, to give it its proper name, has been Wealdstone’s home for a couple of years now and they seem quite at home at last. The ground holds just over 2,300 with seating for around 300 in a small narrow stand that runs along the side of the pitch. There are a couple of covers around the rest of the pitch should the weather deem it necessary. 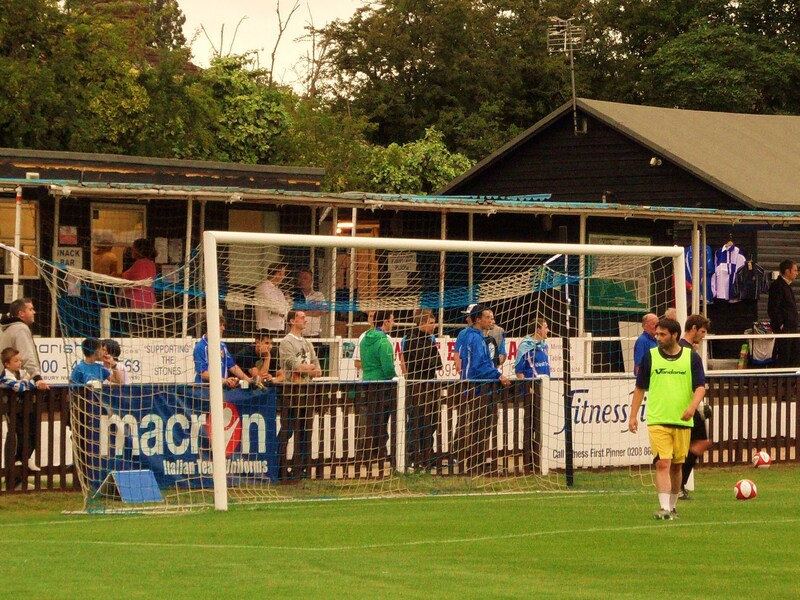 The one thing that Wealdstone does have is a bar, easily big enough to cope with the thirstiest of away followings. In one corner is a strange looking structure, left over from long a year which no one could tell me what it actually was. 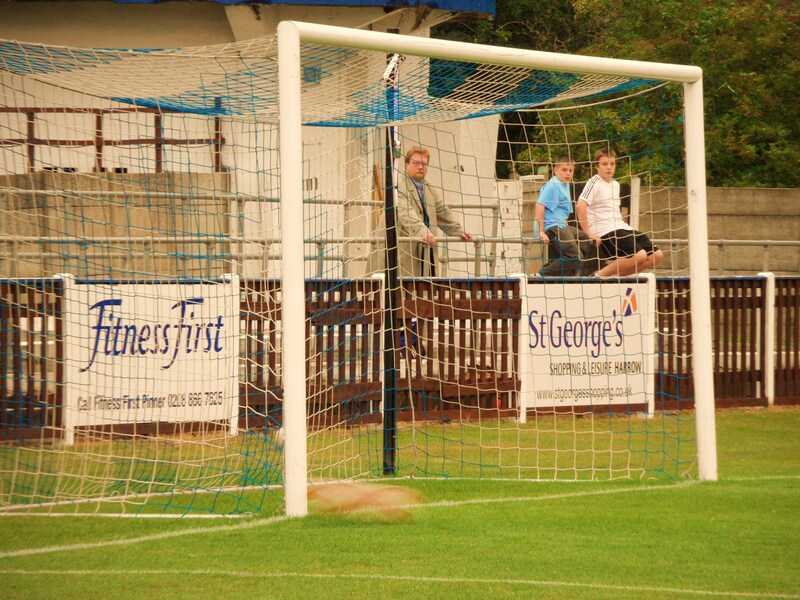 Behind the goal where the changing rooms are you will find the club shop and the refreshments bar, with a net protecting the queue from the often wayward shooting on the pitch. One unusual feature is the concrete walls that runs behind this area as each panel is sponsored, including one by the team itself. How to get to Grosvenor Vale From the M1: Follow Signs for Heathrow Airport on the M25. Come off at Junction 16 onto the A40, come off at The Polish War Memorial junction A4180 sign posted to Ruislip, continue on West End Road, right into Grosvenor Vale after approx 1.5 miles, the ground is at the end of the road. From the M25: Follow Take Junction 16 Off M25 onto A40. Then Come Off at The Polish War Memorial junction A4180 sign posted to Ruislip, continue on West End Road, right into Grosvenor Vale after approx 1.5 miles, the ground is at the end of the road. From Ruislip Manor Station (Metropolitan Line) turn left out of the station, then 1st right into Shenley Avenue, 3rd left into Cranley Drive, the ground is 50 yards on the left. From Ruislip Station (Metropolitan Line) Turn left and walk up the stairs turn left again and go over the bridge into West End Road, walk down approx 200 yards and turn left into Grosvenor Vale. From Ruislip Gardens (Central Line). Turn right into West End Road and keep going for approx 1/2 mile turn right into Grosvenor Vale, the ground is at the end of the road. Thanks to the club for providing these directions. How to get a ticket for Grosvenor Vale Tickets are £10 for Adults and £5 for concessions for most games, although sometimes the club run some specific promotions. If you hold a season ticket for any other club (apart from the one who Wealdstone are playing) then there is 50% off entry. Our last visit – February 2013 Twenty five years is a lifetime in football. Back in 1987/88 Liverpool were being crowned First Division Champions (this was pre-Sky of course), Luton Town were still plying their trade in the top division of English football and Swansea City were floundering in the 4th tier. But a look at the GM Vauxhall Conference tells so many stories. Wycombe Wanderers, Cheltenham Town and Barnet are the only current sides from that season now playing in the Football League, although a couple of others have tasted the sweet smell of promotion upwards. Kettering Town, Enfield, Northwich Victoria, Runcorn, Telford United, Weymouth, Fisher Athletic, Boston United and Stafford Rangers – all teams who would give their first-born to be competing at that level again today. All have been to the brink (and in the cases of a few of them, actually over the edge and re-incarnated themselves) and yet to recover. And then there are the likes of Dagenham (before they found the Redbridge behind the sofa), Maidstone United who are on the rise once again and then finishing in 21st place in that season was Wealdstone. This was to be the last season they played at the top table of Non League football, but the club could be on the verge of taking another step back to the top table of Non League football. Last season a great run to the semi-final of the FA Trophy built on the foundations of a season that saw them narrowly miss out on promotion via the play offs. This season they are gamely trying to hang on the coat tails of big spending Whitehawk and will fancy themselves to have another shot at the play offs again, and hopefully promotion to the Blue Square Bet South. Standing in their way on this chilly Monday night would be the Rooks, who would be making the long journey north from the South coast. Recent games between the two hardly inspired the stay at home fans to come out in their droves for this Monday night clash. Two 1-0 victories for Lewes at the Dripping Pan (both thanks to debatable penalties) and a 1-0 win for Wealdstone at The Vale last season had the betters among us reaching for another 1-0 scoreline. The current form of the two teams couldn’t have been more different though. Wealdstone had taken 15 out of a possible 18 points from their past six home games, whilst the Rooks had won just twice on the road in the same period. 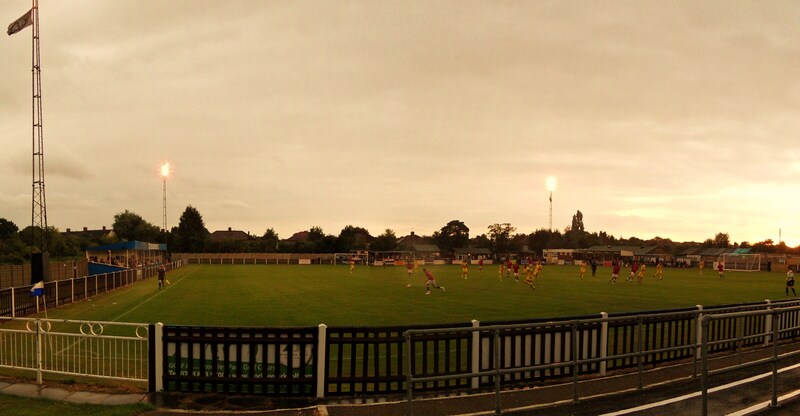 Monday night football has been a feature at Wealdstone for the past few years. Whilst their groundsman may not like having just 48 hours in some cases (such as this week) to prepare the pitch, the fans seem to approve of it. Their offer of half price entry for season ticket holders at Premier/Football League clubs has also boosted attendances on a Monday with very few clashes with professional games. Wealdstone 6 Lewes 1 – Grosvenor Vale – Monday 18th February 2013 Sigh….where do I start. The traffic around the north of London ensured that I didn’t park near the ground until 7:50pm. As I walked into Grosvenor Vale I heard the distinct cheer and then the tannoy announcement of a goal. I should have turned around and gone home at that point. All we could do during the first half was to hide behind our hands as it seemed every Wealdstone attack resulted in a goal. When the fifth went in with still nearly ten minutes left in the half we genuinely thought the Stones would break double figures. I’ve seen Lewes play much worse and win. I have also seen teams play much worse and score more than six. It was one of those games. For twenty-five minutes Wealdstone were unplayable. They exploited the flanks, got great balls into the area and ruthlessly took their chances. Dean and Jolly were on fire and the Lewes back four were simple kindling. However, there were glimpses of sunlight in the game. Nathan Crabb had a great chance to open the scoring for Lewes, and after the break they pulled themselves together in midfield and started battling hard. Whilst Wealdstone took their foot off the gas, Lewes certainly put theirs down. It seemed to be the best fixture in town though, with officials from the Ryman League in attendance as well as Dave Anderson (Harrow Borough), Alan Devonshire (Braintree Town) and Andy Hessenthaler (Gillingham) all in the crowd of nearly 550 including a small travelling contingent from Lewes. There must have been bad omens in the air as even Cynical Dave decided not to travel to this one. Steve Brinkhurst’s effort before half time at least gave us some cheer and the chance for his Dad to remind Kev to “add that one to your KevPad”. Despite Wealdstone finishing with ten men after their centre-back was sent off in injury time for a harsh professional foul, Lewes couldn’t score. There isn’t a lot more I can add apart from that. 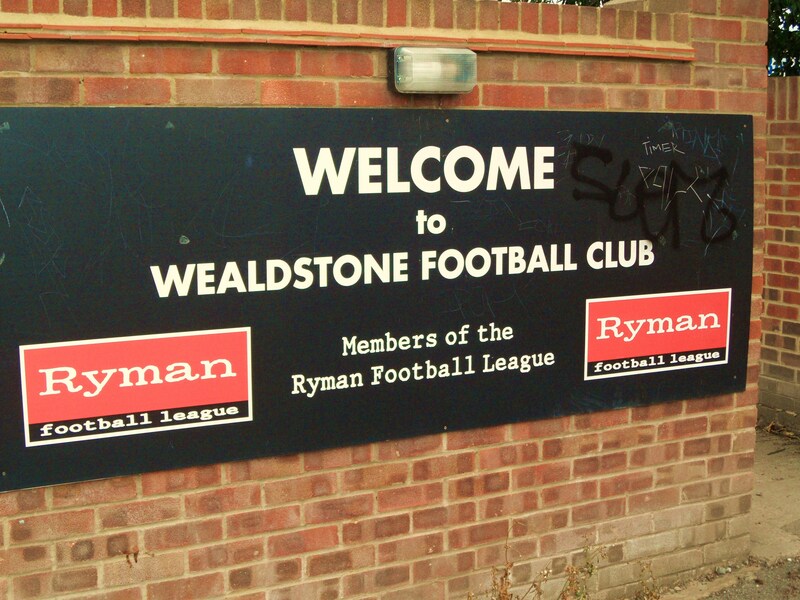 Well played Wealdstone, we wish you luck for the rest of the season. So much for my 1-0 prediction. Next time I will keep my mouth shut and stay at home. Our last visit – July 2010 First week of the summer holidays and the weather is crap. Of course it is. Just as we prepare to that the TBIR roadshow down to Wales we get dull grey skies and rain. So we delayed heading off until later in the day, and as we were heading west it would be rude not to take in a game on the way. The old TBIR crystal ball came out (far more accurate than that Paul the Octopus fellow) and the name Wealdstone floated up through the mist. It is hard to imagine that just thirty years ago Wealdstone were probably the most feared team in the non-leagues (and in the lower reaches of the Football League as well). In those days the Football League was a closed shop, with the 92 clubs all trying to keep the status quo and young upstarts like Wealdstone out of their top table. Despite winning every trophy going in the non-leagues including the Gola League (the forerunner of today’s Blue Square Premier), Wealdstone were kept out. During this period players like Stuart Pearce and Vinny Jones earnt their stripes at the club, making them one of the most uncompromising teams around. The FA Trophy victory at Wembley in May 1985 against Boston United turned out to the their high point, before they fell down the divisions, finding themselves in the Isthmian League before long and more importantly homeless when chairman Alan Clifton sold their ground to Tesco. Yeading, Edgeware Town and Northwood kindly hosted Wealdstone over the next decade or so before the club at last the club settled on a ground once owned by Ruislip Manor, and in August 2008 Tonbridge Angels became the clubs first visitors at their new home. Last season started well for the club but the the harsh winter took its toll on fixtures, and despite having games in hand towards the end of the season, the Ryman’s League rejected a claim to extend the season and Wealdstone became one of the clubs forced to play 3 or 4 games a week in the final month of the season as we reported here. So this season could be their year? Assuming the weather is not too cruel, and the Ryman’s league actually have some sense (I know fact chance of that based on their recent decisions regarding Grays Athletic and Boreham Wood), then Wealdstone could be there or there abouts come the end of the season. Our pre-season experience so far had been pretty good. Four games so far and thirteen goals. Tonight saw the visit of Dagenham & Redbridge. And where Dagenham go, so does Dagenham Dan. He’d been to Dorchester Town and Staines Town in the past week following his team so the chance of another new ground was hard to miss. Saturday’s win at Blue Square South Staines had been memorable for one of those rarely seen football screw ups when someone forgot the kit. Wealdstone 1 Dagenham & Redbridge 3 – The Vale – Monday 26th July Rule 1 for clubs. When you have a game on try cooking some food before the gates open. At 7.15pm with a couple of hundred people in the ground a discussion was going on in the “tea bar” as to whether they should bother cooking any food at all. This was after the umpteenth person had been turned away as they had no “hot options”. Rule 2 for clubs playing pre-season friendlies. Avoid actually printing the line ups in the programme as they are always massively wrong. In this case out of the starting 22 listed, only 5 actually started! Wealdstone have a star of their own off the pitch. Matchday announcer Peter Jon Baptiste is a well known figure to most travelling England Fans and is dry sense of humour extends across the airways at the Vale. “Welcome to all Dagenham fans, all except Dan Campbell (aka Dagenham Dan) with his stupid red coat on” was a good opening. Dagenham were here as part of the deal that took Graeme Montgomery across London last year. Again, this was a friendly played without that friendly spirit. There were niggles, dives, arguments and histrionics and that made it very entertaining. Dagenham always looked likely to score, and despite some good early saves from Wealdstone’s Mcweeney in goal it was 2-0 at half time as Tomlin first headed unmarked into the net and then capitalised on a defensive mistake to make it two. Half time saw the rain fall just as I got my “hot” chips. Smothered with mayo, rain does not make an ideal condiment and despite taking shelter under the strange corner structure that looked like that building at the end of the Blair Witch Project. John Still sat his troops down on the pitch a la Phil Brown style and gave them a “debrief” before subbing them all for the second half. The Dagenham bench had brought their own flasks of coffee, and spent the second half trying to spray Deep Heat up each others shorts – you get the feeling that in three weeks when they roll up to Hillsborough they may get a bit of a culture shock having come so far so quickly. Two become three shortly after half time as Josh Scott pounced on a goalkeeping mistake and it was game over. It made a novel change to see football played in the dark after so many long summer’s nights but just reminded you of what was to come. Wealdstone got some reward for their efforts as Greg Ngoyi volleyed home a smart goal after some good work down the left hand side. A good run out for both teams in the end and a perfect start to our week on the road. Y bêl yn rownd. For a view from last season when Lewes visited in the FA Cup click here.